Humbie Kirk is a striking stone kirk which stands in a loop of the Humbie Water half a mile north of the hamlet of Humbie in East Lothian. There are two approach roads. One follows the line of the river north from Humbie, while the other, which maps suggest is the less minor road but is actually rather marginal in places, approaches from a junction on the B6731 to the south east, before dropping steeply and narrowly into the river valley. Limited parking in available near the kirkyard gate to the north of the kirk. You would need to go a very long way to find a church with a more attractive setting. 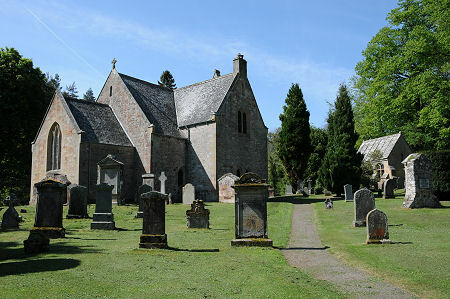 The river curves round closely on the southern side of Humbie Kirk and with the surrounding trees and scatter of attractive cottages and conversions (one neighbour lives in what was previously a large lectern doocot) the phrase "rural idyll" springs immediately to mind. You enter though a gateway on the north side of the kirkyard, and then progress through an arch of apparently fairly ancient stonework before emerging into the kirkyard proper. As you wander along the path towards the kirk, your attention is drawn by a number of fine and unusual gravemarkers and memorials, some of which we touch on in more detail below. Humbie Kirk carries the date 1866 above the main door at its west end. This is misleading. The kirk was built in 1800 on the site of an apparently ruined pre-Reformation church by the architect James Tod. A vestry was added in 1846, which incorporated the first heating system for the building. In 1866 the porch at the west end was added (which is why it carries the date of 1866) and the roof was renewed. It is thought that this work was carried out by the architect David Bryce. The final addition was of a chancel at the west end of the nave, which was built in 1930 by W J Walker Todd. The interior of the chancel was lined with stone from the nesting ledges of the by now disused nearby doocot. At the same time the interior arrangement of the church was changed. 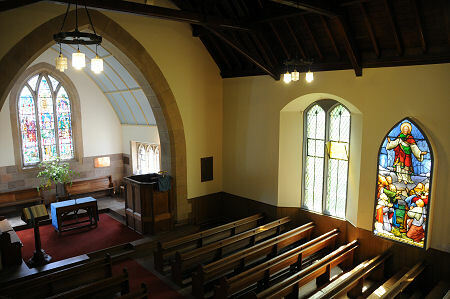 Until then a typical T-plan seating pattern had been in use, with a pulpit mid way along the south wall, and seats on all three arms of the "T" facing in towards the pulpit. In 1930 the current arrangement of a nave with east facing seating was implemented, and the ground floor of the arm of the "T" was partitioned off: though galleries remained at first floor level there and in the west end of the kirk. 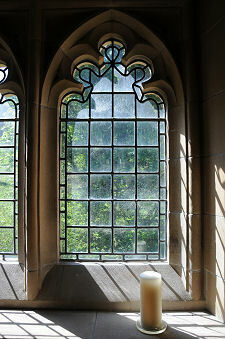 When the chancel was added the old east window was placed in the mausoleum in the kirkyard, and only found again in the early years of the current century. The window was covered in dust and bird droppings when rediscovered, and one of the four panels had been badly damaged during the better part of 80 years of neglect. 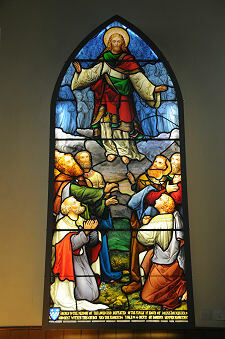 It was restored to its former glory by the Stained Glass Studio at their base near Dalkeith, and is now on illuminated display on the south wall of the nave, approximately where the pulpit would have stood until 1930. It is simply magnificent. 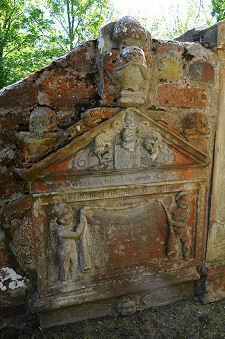 The kirkyard is home to a number of reminders of the presence of an earlier church on this site. Most obvious is the fine collection of gravestones, a number carrying dates in the 1600s and 1700s. 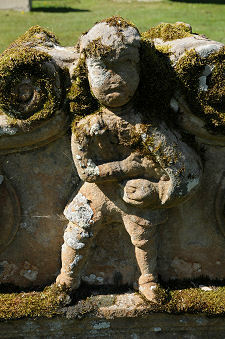 Most striking of all is the gravestone close to the path through the kirkyard whose occupant and date are now lost to erosion, but which carries a magnificent carving of what appears to be a boy playing a set of Northumbrian pipes. To the west of the kirk a poignant inscription refers to an occupant who "dyd young". At the east end of the kirk, beyond the 1930 chancel, things get more interesting still. Here you find a very thick piece of stone walling with a line of memorials on its western face recording people who passed away in the latter half of the 1600s and more recently. It is very tempting to draw the conclusion that these memorials originally featured on the inner wall of the east end of the pre-Reformation church and this stretch of original wall was retained in 1800, in part because it fell outside the footprint of the replacement church and in part because of a desire to preserve the memorials. Less old but equally intriguing is the free-standing aisle or mausoleum to the west of the kirk. This is dated 1864 and carries an inscription saying that it was erected by John Broun of Johnstounburn "in lieu of the burial place of his family within the church, which, in deference to the feelings of the parishioners, he has now closed". There is something about this inscription that appears to leave unsaid much more than it says, and that leaves you wanting to know much more than it chooses to reveal about the story behind the building of the aisle.